Who would have thought that 10 children crying in the space of an hour would bring about a sense of satisfaction? This is not an inappropriate appreciation of other people’s pain but a sense that it is far better for a child to cry because they hurt themselves in the playground than for them to lose their life from playing in the road. Jabulani Foundation are incredibly grateful to have received a sizable and generous donation from the Managing Director’s Committee of one of South Africa’s largest Corporate companies, which has enabled us to do a number of things. The grant has made the building of two new playgrounds possible; one for the pre-school and one for the community centre. Offering our children a safe environment to play in, as opposed to in the road, will make a huge difference to the community. The playgrounds are complete with jungle gyms, swings and slides and are already being used by plenty of children every day. 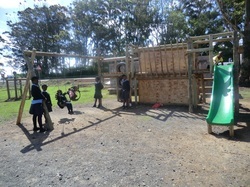 It is truly rewarding to see the children playing safely in the playground! The pre-school also now has a much needed and essential new toilet block with proper child-friendly toilets as compared to the single unsuitable long drop that was there before. The pre-school storeroom rondavel has been renovated for use as a second classroom and will be put to good use by the implementation of either a Grade R or pre pre-school group. A TV and DVD player complete the developments at the pre-school, allowing for the children to benefit from educational movies. Last but definitely not least, a portion of the funding was used to acquire further books and bookshelves for the community library. The funding has been greatly welcomed by all involved and the effects of its impact in the community are already recognizable. Our sincere thanks go to all who made this funding possible.